These Spiced Honey Brushed Chicken Thighs are simple. Simple to prepare, simple to eat. But how can I begin to share how amazing they are? I ate three the first time I made them just standing off the stove. Not kidding…a must make! This past Saturday was the monthly get together of our local blogger group; we vary between coming to my home to break bread or going out for brunch at a local restaurant. Although originally started as a way to discover other locals that share the commonality of food blogging, the truth is that after a bit more than a year it’s been the source for some real friendships and we all really enjoy getting together. This month I scheduled our meeting at my home so that we could meet a member’s new baby daughter Maggie. Her mom Sara is the blogger behind Saucy Dipper and sweet Maggie has already been tagged ‘The Little Dipper.’ I think this might stick and am already imagining Dip and Dipster as she gets older. Maggie is only 3 months old but she was perfect. Everyone was smitten and we are looking forward to seeing her again. I loved that she let us hold her and didn’t fuss; OK, she made sure to hone in on where mom was, but still we all got a dose of cuteness up close and personal. Soon she will have a baby blogger companion when Charmaine has her baby in a couple of months. Talk about teaching them young…forget Toddlers and Tiaras, I’m already imagining Toddlers with Toques! I love how we always have such a mixture of things to eat when we get together even though we have one steadfast rule. Bring what you can if you can. We love getting together to chat and eat but it’s important no one feels pressured because of a dish; if anyone has had a hard week or a crazy morning…come empty handed but come; we will always have plenty of great food! On this particular morning, Andrea from Fork Fingers Chopsticks was frying eggs and serving them with black beans and salsa, and Sara brought some fabulous local cinnamon rolls. Anne Marie made a gorgeous blueberry and cream cheese stuffed French toast as well as showed up hauling 3 huge carriers filled with fish and game that she had to get rid of before a move. Charmaine with Speakeasy Kitchen brought a gorgeous fresh fruit salad and some eggs for me from her laying hens. I can not wait to try them and share the experience; especially to compare the flavors of the different color eggs laid from different types of hens. Jane with No Plain Jane’s Kitchen brought some delicious flatbread that was perfect with the eggs. A new member of our group, Ansh, is from India. Her blog Spice Roots encompasses a wonderful and wide range of dishes and she shared one with us on Saturday morning, Chicken 65. It was fabulous…and fiery. And gone; not a leftover bite in sight! I’m sure that dish was on my mind when I decided to peruse the cookbook I had just received from my friends Mark Scarbrough and Bruce Weinstein. I got to know Mark and Bruce last year during the month long Goaterie challenge that Rachael at La Fuji Mama and I held. They are the authors of the book ‘Goat‘ and were not only huge inspiration for all of us but wonderful sources of information (and we’re doing it again in July of this year!). 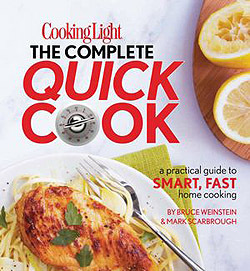 When Mark asked if I would like to check out their latest cookbook, ‘Cooking Light’ ‘The Complete Quick Cook’ I readily agreed. I’ve come to respect not only their cooking chops but their friendly and down to earth demeanor and that is so readily evident in this cookbook. Filled with dishes that are both easy for the home cook to prepare and tasty too it is also peppered with lots of tips to make everyday cooking easier; for newer and seasoned cooks alike. It was almost prophetic that the dish I first spotted was for Spiced Honey Brushed Chicken Thighs. I was longing for some more of that spice and these delivered perfectly. Maybe not quite so hot as Ansh’s dish but for a family dish I could see that as a plus. But I’ll tell you this, it had to have been one of the simplest and yet tastiest chicken dishes I think I’ve ever made. I had two packages of boneless chicken thighs that equated to doing about one and one-half times the given recipe and I was wondering if a serving could be considered one package of six pieces. Yes…I really could have! Mark and Bruce were kind enough to provide me with a copy of the cookbook to peruse and offer another one for one of my readers too. You know the drill…check out the specs after the recipe and promise me something. Make this chicken. Then be honest about whether you could have eaten 3 servings too. I know the answer. Some spices and a bit of honey transform chicken thighs to a great dish. Combine first 6 ingredients in a large bowl. Add chicken to bowl; toss to coat. Broil chicken for 5 minutes on each side. Combine honey and vinegar in a small bowl, stirring well. Remove chicken from oven; brush 1/4 cup honey mixture over chicken and return to oven for 1 minute. Remove chicken from oven and turn over. Brush chicken with remaining honey mixture. Broil 1 minute or until chicken is done. Boneless thighs can actually be cooked in one flat piece but I tucked meat from both sides under the main part to simulate the thigh with bone in and it cooked perfectly at this thickness. Quick Tip from the book: Always reach for a larger bowl than you think you need. Using a bowl that is too small can result in spills and makes stirring and whisking more difficult. This was first published when the Little Dipper was so little; she was here Saturday with her mom…just adorable toddler now. Try these Liz; you’ll see. Sounds like a great blogger get together & what a cutie that baby. 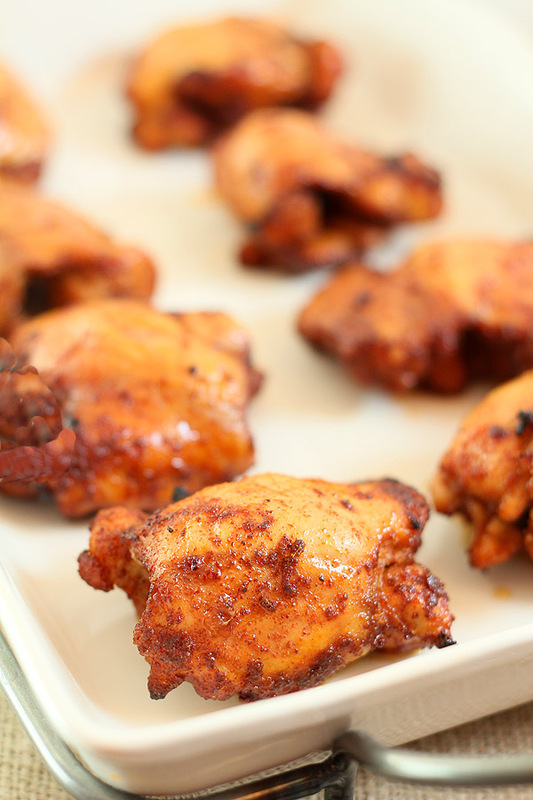 Love this spiced thighs recipe. Thanks Shulie; it is seriously one of our favorites and being easy is one of mine! Love this recipe….nice twist with spices…my boys loved it!! Yes I am familiar with the cookbooks …have one and use it often. So good to hear Deb…I know I love them, I could make a bunch every week I think! this chicken looks so moist and tasty. This is a winner! Well done on this recipe! It became a huge favorite after the first time I made it. And? I can still stand at the stove and eat a couple of them right out of the oven. So good! It’s not as if this recipe need another great review…..but it’s going to get one! This is fabulous, I’ve made it twice in one week already. I serve it with white rice. Going in the “regulars” recipe binder! Thanks for the yummy dinner! Don’t you just love them? I can’t quite remember something so easy that had me devouring it at the stove and wondering if I would have any left for dinner. No, I am NOT kidding…so glad you enjoyed them too! I enjoy following you on Twitter and seeing your recipes! 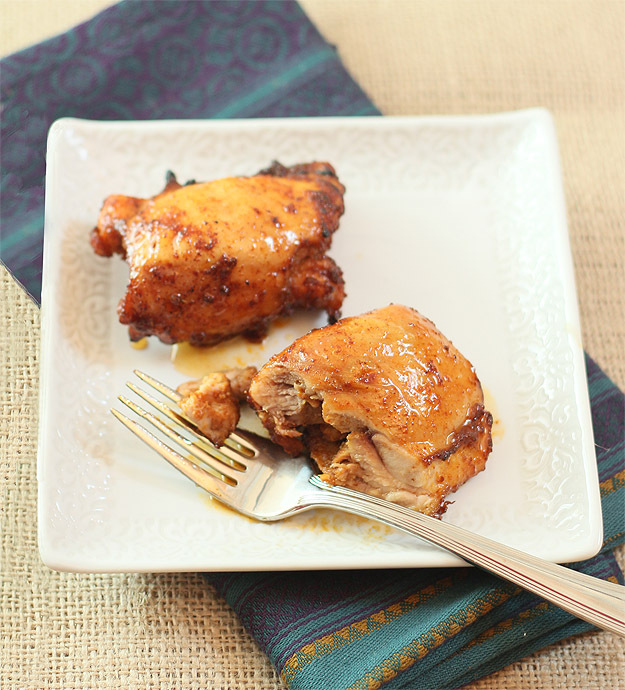 This honey chicken looks spicy and delicious, definitely trying this one this week!! I have tweeted and am going to try this delicious recipe this week.I am in Canada.. Following both now and tweeted as well. Thanks again! Motherhood comes with its own challenges, not to miss the uphill task of shedding all those “baby” pounds. I was frantically looking for recipes that would help make that task less daunting , and that’s when I picked up my first issue of the Cooking Light magazine. How awesome to know about the Cookbook! Thanks for having this give away. Not as familiar with the cookbooks, but I do love love love Cooking Light magazine. The chicken looks sooo good! I ate it for 3 meals and was still sad when it was gone. That’s how good it was! Such great success with the first dish, now I need to try another huh? These look great and I can’t believe how fast they cook! I may have to do more broiling 🙂 Thx for the recipe; very excited to try it. I’m so often inclined to grill no matter the recipe but I’m glad I tried this too…was SO quick. Really did help that I covered the baking tray with foil. Quick cleanup is important to me too. What a darling baby, and your chicken thighs look wonderful too. Can’t wait to make your Sweet Potato casserole soon too. Thanks Kristi…all credit the guys behind the Cooking Light cookbook. I seldom make a recipe without making modification…this one I did just as called for and would not change a thing! Brunch was wonderful, but the Little Dipper gets my vote as “most delicious.” She was cute enough to nibble on! I’ve been a subscriber to Cooking Lite for years and love their cookbooks, too! I have mutiple Cooking Light Cookbooks…and now I have triplets and need a “Quick” Cooking Light cookbook…thanks for having this giveaway! I love cooking light magazine, I can only imagine the cookbooks are just as great! Love this recipe! Appreciate having something simple and so delicious in my week night arsenal (which gets very repetitive and dull). And the ‘LD’? Could not be cuter! I don’t know anything about the Cooking Light cookbooks, but I sure would like to! I love Cooking Light magazine and have been wanting one of their cookbooks for years. Seems like in these economic times, there’s less and less extra funds for my cookbook obsession. This dish proves that it’s really all about maximum flavor without adding a bunch of fats or sugars. Love them too. I get the Cooking Light Magazine, but haven’t ever really looked at their cookbooks. I am going to give this recipe a try this weekend though for sure, I have chicken quarters in the fridge that need some love, nothing better than spicy love! Let me know how it turns out for you Jo…hope you enjoy it as much as we did. Those thighs look delicious! And that’s an adorable baby! What a cutie! Yes, the baby AND the chicken!! Sounds like a wonderful get together – that is definitely one of my favorite things about blogging is meeting people who “share our affinity for food culture”!! Definitely bookmarking this chicken recipe since (a) we eat a ton of chicken and (b) La Crosse season is upon us which seriously challenges my dinner options on game nights! I can’t wait to try something else from the book; this was such a huge winner. I could have eaten six of them; with boys? You best have a truckload! omg this looks amazing!!! I want it NOW!!!! I actually really enjoy cooking light magazine but didn’t realize they had cookbooks. So simple and so good…I think the perfect weeknight dish actually. I made some rice and green beans. Just finished the last of them and am now sad. I love Cooking Light! I don’t actually have any of their cookbooks, but I am always searching for and making their recipes on CookingLight.com. That chicken looks yummy, and I definitely need quick cooking solutions because I am usually already hungry by the time I start cooking! And I love that you have a local food blogger meet up. That’s so cool! I’m so glad I started the group Alexis; we have a lot of fun together and I suggest others try the same thing. I only knew 1 other local blogger before I did it; now I now 35 and about a fourth of that number come to every get together so I’ve made some great friends. I love Cooking Light- I get the magazines, and use the Cooking Light Way to Cook Vegetarian book all the time when I’m having vegetarian friends over, or for inspiration for my meatless nights… the chicken looks delicious! I’m loving this spiced honey chicken recipe & really enjoy reading cooking light magazines and there cookbooks! Cooking Light magazines are my favorite source for recipes (other than food blogs) but I’ve never tried one of their cookbooks. I don’t know which looks better – those chicken thighs or that sweet baby! What a doll! Well I loved the chicken thighs and I could have just eaten Maggie up too but you would say the same…she wins hands down. So dang cute. I love Cooking Light, and their cookbooks. Their recipes are down-to-earth and always flavorful. I have a few recipes in my back pocket that come out all the time that were developed by them! I couldn’t agree more Kimmy and I admit I’m loving this one with Quick recipes. I need more of those. I think I’ve heard of Cooking Light, but I’m fairly new to the cooking world and could be wrong! They publish a magazine and then occasionally cookbooks; either annual compilations or special books like this one. I like them because they are Cooking ‘Light’ not Cooking ‘Diet’ – I don’t like recipes that want me to use fake ingredients to keep them light. I’m not familiar with the cookbooks. I’m afraid I’ve become so dependent on the web that I rarely sit down with a book. Having said that, though, when I’m stuck on ideas or about to make a grocery list I do enjoy thumbing through one for ideas. That’s much easier that googling “what should I have for dinner?” . Thanks for your kind words about Maggie. She is a cutie! I bet people Google just that! I have so many cookbooks I need to get through; did you see that 3 foot stack on my counter? You could borrow some of mine you know. Actually… I was admiring your stack this last time. Quite a collection! What an adorable little girl! It sounds as though all of you put together an amazing meal. My family adores chicken thighs and I am going to pull some out of the freezer to make this tonight. I’ll let you know how it turns out! By the way, I always love Cooking Light cookbooks. I refer to mine often. Everybody really enjoyed this recipes, husband and kids alike. It was very easy to put together, cooked quickly and had a really nice spicy-sweet flavor. This one’s a keeper! Thanks, Barb. So glad you enjoyed it too Dara; I know I was really pleased with how quick it was. Though I can’t deny that’s in part to now being able to find boneless chicken thighs. I would never have de-boned them myself so am loving that they’ve become so readily available. I’m not entering the contest but I’m all in for dinner on the table in 22 minutes! These chicken thighs look delicious. Your blogger get-together’s menu sounded amazing too and little Maggie is such a pretty girl! We always have such great food but then…well, you can imagine it’s kind of a given. I’m the one that never gets anything made! Unfortunately, I am not familiar with “Cooking Light” cookbooks but they sound very interesting and this chicken recipe looks absolutely delicious. I can’t wait to give it a try. Both the magazine and the cookbooks are great in that they have recipes that do keep it light but they’re not ‘diet’ cookbooks. Just good food with attention paid to keeping the fat and calories limited. That lil Dipper is a cute bundle of Happiness and is going to very beautiful just like her mom. It is always wonderful to meet the group. I’m so sorry to have missed the get together! I’m still getting unburied after being away so long and have family in town all week (including my very own 1 month old great-niece!) so just couldn’t swing it! Followed on twitter, but the tweet you have is too long – had to shorten it up a bit! I’m new to the site, but these look fab! I was just about to order this – but I’ll just have to keep my fingers crossed to win one. I have about 5 other cooking light and all of Mark & Bruce’s Ultimate books. The broiler element is broken on my oven, do you think I can bake these? Or will they not come out right? I think baking would be fine Kat; they will just take longer; I’m guessing about 45 minutes or until the internal temperature is 165 degrees. Thanks for your other comment too…the perils of finishing something as late as I did this post might be not thinking about the length of that tweet! Fixed. Oh Maggie is beautiful! I do see her pretty mother in her. In addition to Maggie I am so sorry that I missed the blogger buffet. There is always such fab food. Now after the food description and these chicken thighs, I’m hungry. Me? Pretty? You made my day!